The Valley of Wells is an interactive and performative installation, framed around the stories and mythology of the Valley of Wells. The Valley of Wells is the valley of the Fleet River (also known as the River of Wells) in London, which runs from Hampstead Heath down to Blackfriars, passing through Camden, Kings Cross and Farringdon. The installation includes artwork inspired by my research into the Valley of Wells, including maps, screenprints, paintings and watercolours. I bring a live element to the space in the form of ongoing storytelling, sharing the stories and myths I have found about the area with anyone who would like to hear them, and answering any questions I can about the area. This performance is conversational, and like the stories themselves interweave the many layers of history together led by the curiosity of the audience. Another key component to the installation are Wish Jars of Fleet River water collected from a fountain on Hampstead Heath, the heavy sediment of this mineral rich water collects at the bottom of the jars. In a play on the wishing well tradition (a modern survivor of the magical worship of wells), audience members can participate by writing their wishes on the labels and tying them to the jars. For these wishes to have a chance of coming true the water of the Fleet must be returned to the end of its ancient destination, the Thames. In a collective mass performance, you are invited to join the Water Carriers as they leave Kings Cross and follow the course of the Fleet River down to Blackfriars, to empty the Wish Jars into the Thames. 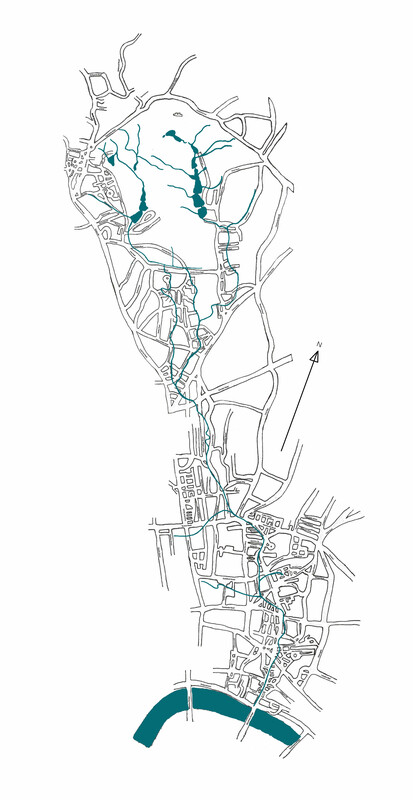 2-mile walk from Kings Cross to Blackfriars along the course of the buried River Fleet to carry peoples wishes to the Thames. 27 May, leaving at 4.30pm prompt.